After getting off Megabus, we had to walk all our way to the Port Authority bus station - we had chosen to walk since taking the train or the bus would've taken the same time! It was a long back to get to 42nd street. Once we got near the Port Authority bus terminal, our priority was to get some dinner. We headed to Villa Fresh, for some good italian food. After dinner, we headed to Port Authority Bus Terminal. We had a tough time hunting out the platform where our bus would depart from. We kept roaming around the same place for a while as we kept following signages. 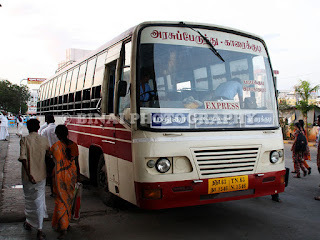 After a bit of walking around, I enquired with a bus operator, who gave us precise instructions to get to the platform. It was a very confusing route, and we got to the platforms located at the basement level of the north building. The gate details were given to us at the time of reservation itself, and we headed straight to Gate #62. This gate is also an arrivals gate. 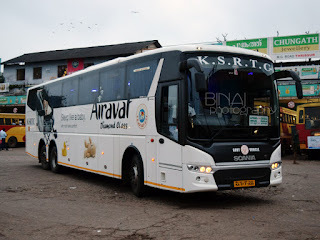 Our bus was to depart only at 0045hrs, and a fairly long queue had already formed. A Buffalo bound express was boarding at Gate #61. As the door opened, I saw a Prevost X3 heading to Buffalo, while an MCI D4505 was parked at Gate #62. I badly wanted a Prevost X3, since I hadn't tried this model yet. A little disappointed, I briefly considered taking the Express to Buffalo - but I realised it wouldn't go to Rochester! A lot of passengers travelling on our bus switched over to the express to Buffalo - especially passengers connecting beyond Buffalo, and people going to Syracuse. Boarding commenced at 0022hrs. We were at very close to the door, and were among the first to board. I got excited as the driver actually led us towards a Prevost X3-45 parked at Gate 64 instead! Yes! 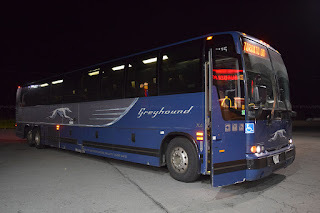 It was not the MCI D4505 that was taking us to Rochester that night. On duty that night was #86115, a 2011 Prevost X3-45 powered by a Volvo D13 engine mated to an Allison B500 transmission. The driver collected both the coupons, since he informed that he'd be operating till Buffalo. 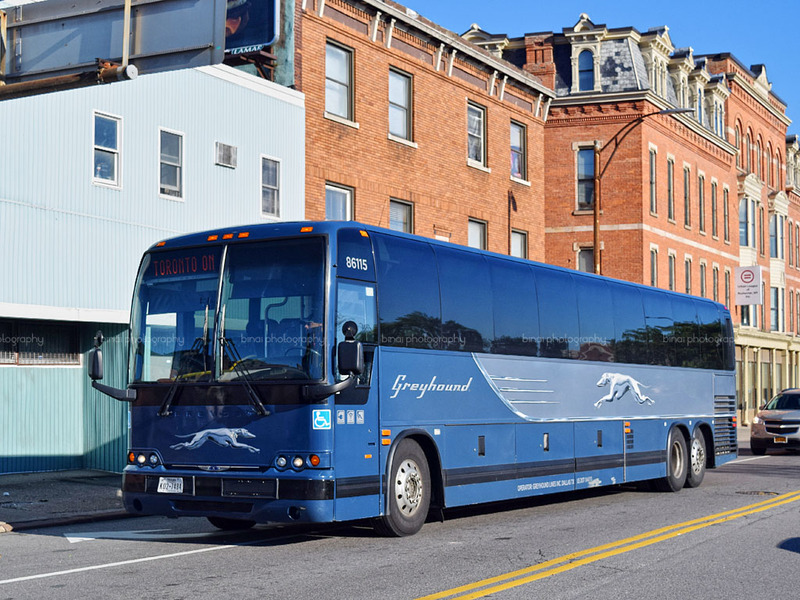 In fact, he also announced that the same bus would operate all the way to Toronto, and passengers wouldn't have to change buses at Buffalo. 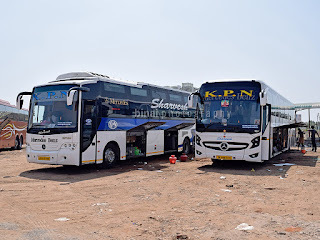 After the boarding was completed, the driver closed the door and made a very elaborate announcement about the different features of the bus - he did a manual announcement since the PA system was reportedly non-operational. His name was Amaan. We backed out at 0042hrs. I was very tired, and dozed off even before we exited the Lincoln tunnel to New Jersey. I woke up just as the bus pulled into the Exxon fuel station at Gouldsboro for a break (0225hrs). I headed straight to the rest room, and then to pick-up a drink from the convenience store there - cold beverages were available for 85₵. I returned to the bus after picking up my drink. We stared from the break stop at 0245hrs. I slept off even before we returned to the highway. 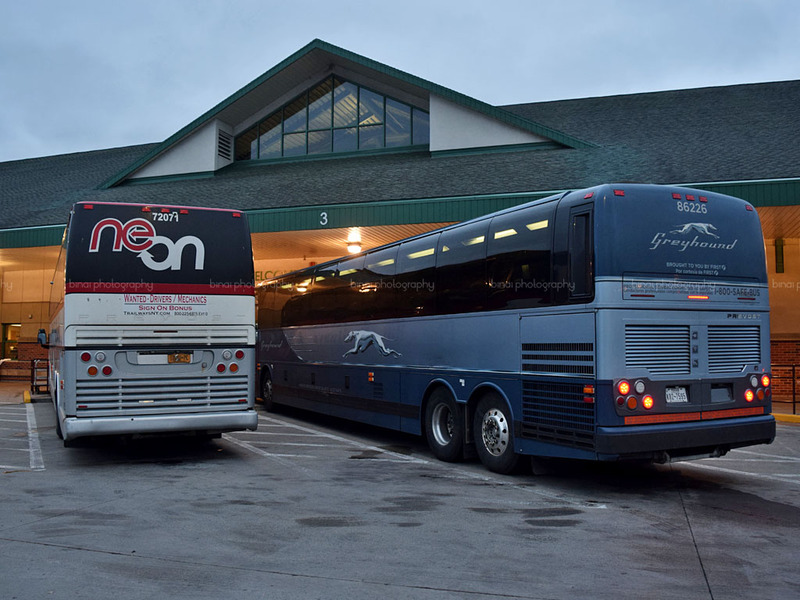 I vaguely remember seeing Binghamton bus station - but did not notice the time. I had a nice long sleep, and woke up just as we pulled into Syracuse, and the driver announced a long break - the time was 0537hrs - three minutes before time. We would depart only at 0600hrs - this was also a rest break for passengers traveling beyond Syracuse. After a quick visit to the restroom, it was time to click some photographs at the bus station. 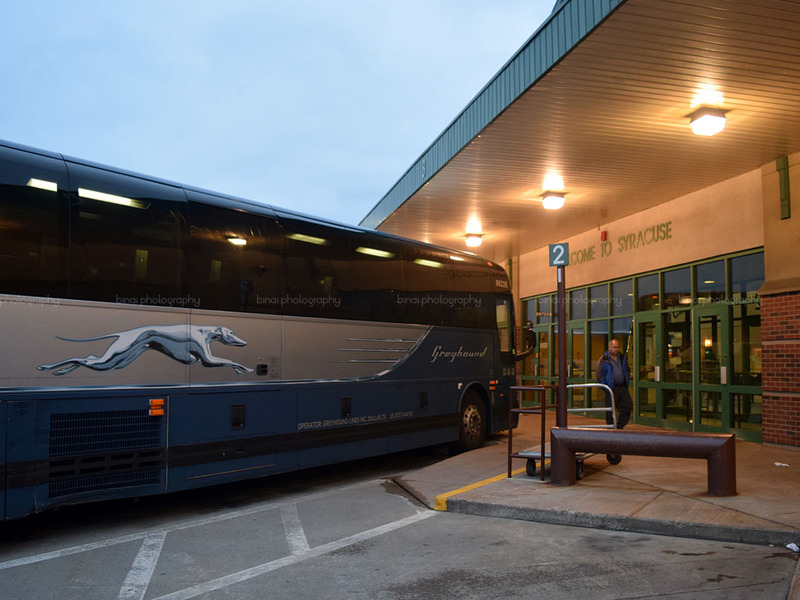 There were no less than 4 Trailways buses and three Greyhound buses parked in the yard at the time. After spending sometime walking around, I was back into the bus. No additional passengers boarded our bus from Syracuse. However, our departure was delayed, and we got moving only by 0614hrs - fourteen minutes behind schedule. I did not want to sleep after Syracuse, and tried hard to remain awake. But I did shuttle between sleep and awake cycle time and again. The onboard WiFi was not working, and the driver had mentioned this before we departed from New York itself. We rushed through Victor, passed Pittsford, and finally turned off Route #490 toward Clinton Avenue. We entered the Rochester Trailways bus station at 0737hrs - three minutes before time. Notes: The bus, #86115, a 2011 Prevost X3-45 powered by a Volvo D13 engine mated to an Allison B500 transmission, appeared really well maintained. The driver was great - very upfront about the non-functional WiFi, possible delays, etc. His driving style was great as well. There were delays at Syracuse, but we still made a before time arrival at Rochester. The WiFi didn't work, but I slept for most of the distance, it would not have made a big difference anyways. Greyhound operators seemed quite poor at keeping time compared to Trailways drivers. Overall a good journey.